Winchester Super-X 22 Long Rifle 37 Grain Plated Lead Hollow Point ammo for sale online at cheap discount prices with free shipping available on bulk 22 Long Rifle ammunition only at our online store TargetSportsUSA.com. Target Sports USA carries the entire line of Winchester Super-X ammunition for sale online with free shipping on bulk ammo including this Winchester Super-X 22 Long Rifle 37 Grain Plated Lead Hollow Point. Winchester Super-X 22 Long Rifle 37 Grain Plated Lead Hollow Point ammo review offers the following information; This Winchester Super-X 22 Long Rifle ammo is a new construction that features 37 Grain plated lead hollow point bullets. This specific Winchester Super-X 22 Long Rifle ammo was developed for target shooting along with small game hunting such as squirrels and rabbits. The Super-X 22 Long Rifle by Winchester has a muzzle velocity of 1330 feet per second and muzzle energy of 135 foot pounds. The Super-X 22 Long Rifle ammo bullet provides penetration and quick energy release with practically no weight loss or bullet fragmentation. 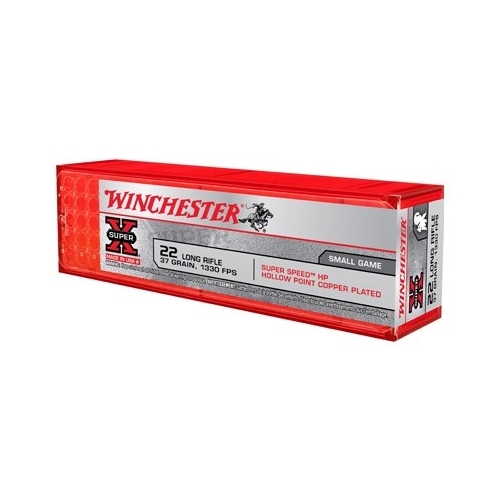 This 22 Long Rifle by Winchester ammo is reloadable, features brass cases and Boxer primers. To millions of gun and ammo enthusiasts worldwide, the name “Winchester” means quality and high-performance by the most complete and versatile line of ammunition in the world. Winchester ammunition products have a long history of innovation behind them and have set the worlds standard in superior shooting performance. Their Winchester M-22 22LR ammo as well as many others calibers use advanced technology to produce high quality ammo for everybody. To stay competitive in today's market, Winchester uses their value pack ammunition to meet the demand of price conscious buyers. In the end, regardless of what the sport, game or circumstances surrounding you, you can always depend on every cartridge in the Winchester Ammunition line to perform - as promised. Very good at a great price! With .22 at such a premium, I couldn't pass up this purchase. Lower cost than most but still insane for the caliber.